Lori-Ann Rickard is one of the country’s top healthcare lawyers. For over three decades, she has advised leading hospitals, doctors, laboratories and other healthcare providers. 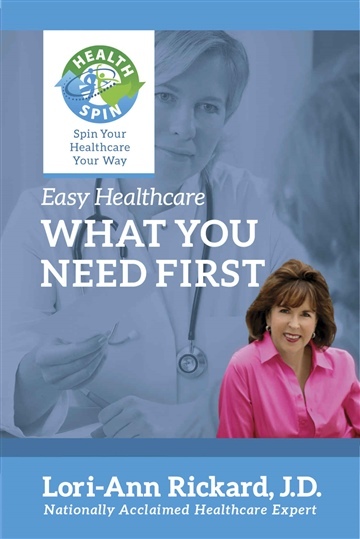 Now she offers her expertise to patients and their families through the Easy Healthcare Series from HealthSpin. Lori-Ann is also a single mom of two beautiful daughters. One of her daughters was very sick when she was born. Already caring for a toddler and managing a developing career, Lori-Ann used her professional experience to create quick, effective strategies to make the healthcare system work for her as she sought the best treatment possible for her sick baby. Later, Lori-Ann served as the primary caregiver and medical coordinator for her proud, independent parents when they became unable to care for themselves. Through their wellness challenges, her daughter’s illness, and in helping friends over the past thirty years, Lori-Ann has used her unique position in the industry to create easy healthcare solutions that work for everyone around her. These solutions will work for you and your family, too. Lori-Ann Rickard is a healthcare insider who knows what it means to be a patient and a caregiver. The Easy Healthcare Series brings you the benefit of Lori-Ann Rickard’s expertise. Let her show you how you can Spin Your Healthcare Your Way.